Teufel updates its bedside iPod dock radio | What Hi-Fi? The new iTeufel Radio version 2, on sale now at £179, has been retuned to give better sound from its 2x7.5W main speakers and 35W subwoofer, and there's a new bass adjustment switch, introduced in response to demand from customers. The screen has also been improved for greater clarity and less glare, and is now less bright at night, while a greater range of colours has also been introduced. As well as the retro wood finish of the original iTeufel Radio, the new model is now available in a choice of Matt Black, Gloss White and Powder Pink. 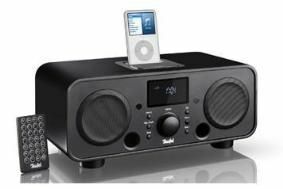 The unit allows you to wake up to the built-in FM radio or music from your iPod, and like all Teufel products comes with an eight-week right-of-return if you're not entirely happy. It's available exclusively from Teufel's online shop.